More and more companies manage their own advertising in-house these days with mixed results. The advent of social media and the ease of apps and other Internet do-it-yourself marketing tools have given rise to the fallacy that advertising is easy and suitable for a go-it-alone campaign. Many even think the traditional ad agency is a relic of the 20th Century they can do without. Sometimes, often slow to adapt and guilty of expensive, mediocre work, agencies are partially to blame for the shift. Smaller companies seem to try in-house advertising at a higher rate. This is usually because the owner, an entrepreneur, is naturally slow to trust, self-reliant and has been personally involved in every aspect of his business from the first day. If he didn’t do it – it didn’t get done. It’s shocking how many multi-million dollar companies continue to operate this way. 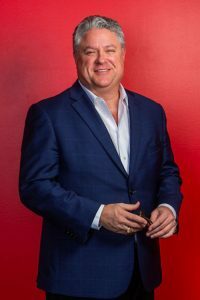 There just isn’t any way an owner can match all of the skill sets and experience of even a good, small ad agency; and the owner as CEO should use his time driving policy and managing, not diving into the minutiae of an advertising campaign. Removing the owner’s ego is often a common hurdle in planning and executing any ad campaign whether in-house or with an agency. The best ad agencies realize that understanding strategy is paramount to the success of any campaign or marketing project. They will have experienced people on their team that help shape and conduct ongoing strategy with the client. Creative capabilities are what most potential new clients focus on and sure it’s fun and exciting to innovate and create ads and campaigns but the creative process is often where the do-it-yourselfers stumble. It is never as easy as it looks. Great creativity comes from good strategy based on research, real world observations, insight and hard data. Creative directors and art directors are trained to use their artistic tools to make a strategy come to life; to capture the imagination and touch customers’ hearts and minds. Content and good copy writing is another area where in-house advertisers typically fail. It is nearly impossible to have all of the essential advertising skill sets under one roof. If they are that good why aren’t they in advertising to begin with? I cannot tell you how many times I have witnessed CEO’s tap a family member to create a logo or task a staffer to build the company’s new website. You have to be kidding. No, it happens all of the time. Lastly, any in-house ad plan must consider media planning and buying. Outdoor, TV, radio and other older media have all followed Google AdWords lead and made is easier to cut out agencies. They make it look easy for your company to save money by working directly with them and using their own graphic artists or production team to compose ads. Sounds great right? Wrong. As evidence I offer the typical local cable TV commercial. Usually a low quality abomination tucked in neatly between slick, professional national spots for Apple, Ford or Samsung. How many billboards do you see in your hometown with tiny print, no headline or worse that fail to communicate any cognitive thought within three seconds? Simply awful. Without a CMO or advertising manager on your staff, there is no way the average business has adequate knowledge of various media and their value, strengths and weaknesses. Even with some marketing folks on your team, they are best utilized directing and judging work coming from your own ad agency; one with the experience and firepower to manage your strategic, creative and media needs. Many factors determine your company’s advertising success. 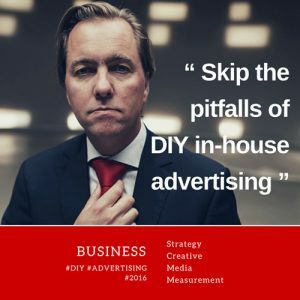 The DIY in-house advertiser is at a distinct disadvantage and doesn’t know it. The lack of strategic, research, creative and media assets can spell failure before you ever begin. Unfortunately, many advertisers look at advertising as an expense not a sales opportunity. Whatever size your budget, you cannot afford to waste it. Ad campaigns are living breathing organisms that are born and bred then grow and require constant assessment and adjustment. And lastly, advertising results must be measured. Admit it. Most small and medium firms delude themselves that they can manage their own advertising saving money on an ad agency. Just the opposite is true. If the campaign fails to produce new sales or reach other strategic goals, then those dollars were wasted. Of course that’s easier to swallow if results aren’t tracked and measured. But agencies must bear part of the blame for decades of over billing for mediocre work. That’s why the right agency for you should be closely vetted before signing an agreement. Today, lots of companies do their own advertising, but does it actually get results? Nope. That’s probably why they see advertising as only an expense — a necessary evil. That’s a shame.